Pledging To End Two Wars, Obama Finds Himself Entangled In Three : Parallels The president wanted to bring home all U.S. troops during his tenure. But it now looks like U.S. forces will be fighting — on a limited basis — in a trio of wars when he leaves the White House. President Obama salutes prior to boarding Air Force One last Friday. The president entered office saying he would end the U.S. role in the Iraq and Afghan wars. But U.S. forces were sent back to Iraq last year and he announced Thursday that 5,500 American troops would remain in Afghanistan beyond their previously planned departure at the end of 2016. 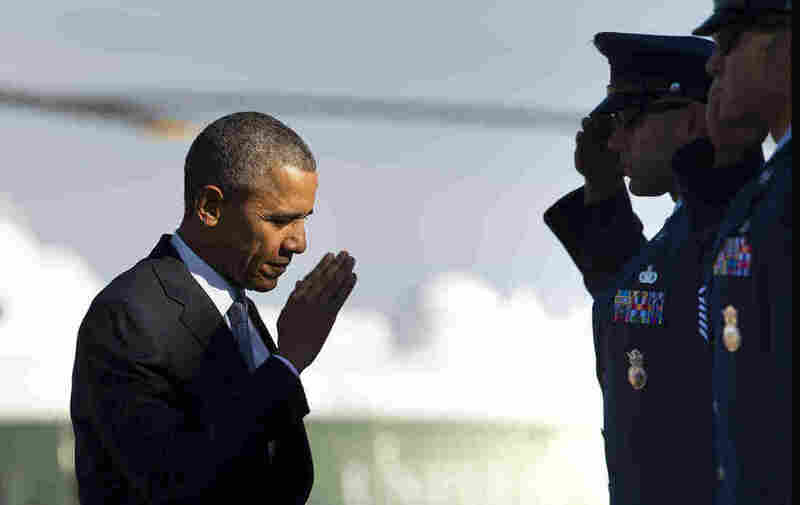 President Obama entered the White House with a pledge to bring home U.S. troops from two major wars. Now it looks almost certain he will leave office with U.S. forces engaged in three ongoing conflicts: Syria, Iraq and Afghanistan. Throughout his tenure, Obama's impulse has been to shrink the U.S. military footprint in the Middle East. He's called for a greater emphasis on diplomacy, and taking the broader view, he wants the U.S. to shift more resources to Asia and the Pacific. "When I took office, nearly 180,000 Americans were serving in Iraq and Afghanistan. Today, all our troops are out of Iraq. More than 60,000 of our troops have already come home from Afghanistan. With Afghan forces now in the lead for their own security, our troops have moved to a support role. Together with our allies, we will complete our mission there by the end of this year, and America's longest war will finally be over." But as the Middle East goes through a period of historic upheaval, Obama has changed course. He's faced criticism from some liberals who say he hasn't stuck to his promises, and from many conservatives who argue that the military drawdowns have weakened the U.S. standing. Overall, the U.S. military presence in the region is a small fraction of what it was when Obama entered office. Yet during his presidency, the U.S. has bombed seven separate Muslim countries. He's reluctantly launched an air campaign in Syria, returned U.S. forces to Iraq, and on Thursday he announced he would extend the stay of the troops in Afghanistan. He again emphasized this was not his preferred option. "As you are well aware, I do not support the idea of endless war. I have repeatedly argued against marching into open-ended military conflicts that do not secure our core security interests," he said. But, he added, "I'm firmly convinced that we should make this extra effort." Afghanistan: For most Americans, the Afghan war dropped off the radar when the U.S. formally ended combat operations last year. But that changed recently as the Taliban briefly captured the northern city of Kunduz, their biggest military success since being driven out of power in 2001. A U.S. airstrike in support of the Afghan military then killed 22 civilians at a hospital in Kunduz. This episode, and the controversy that has ensued, have revealed how the residual U.S. force of nearly 10,000 remains actively involved in the war. The U.S. military has flown more than 3,300 sorties and fired on enemy forces 629 times this year through the end of September. Twenty-five Americans, including military personnel and civilian contractors, have been killed this year, Obama noted in his White House remarks Thursday. Obama introduced a U.S. surge in Afghanistan early in his tenure, upping U.S. troop levels to more than 100,000 and pushing back the Taliban on several fronts. But he wanted American forces withdrawn by the end of 2016, aside from perhaps 1,000 or so who would be based at the U.S. Embassy in Kabul. He said Thursday that 5,500 troops that will remain beyond 2016, and they will be present at three bases outside the capital. While those numbers are still small, they show the Taliban remains a threat and the U.S. doubts the ability of the Afghan military to keep them in check. 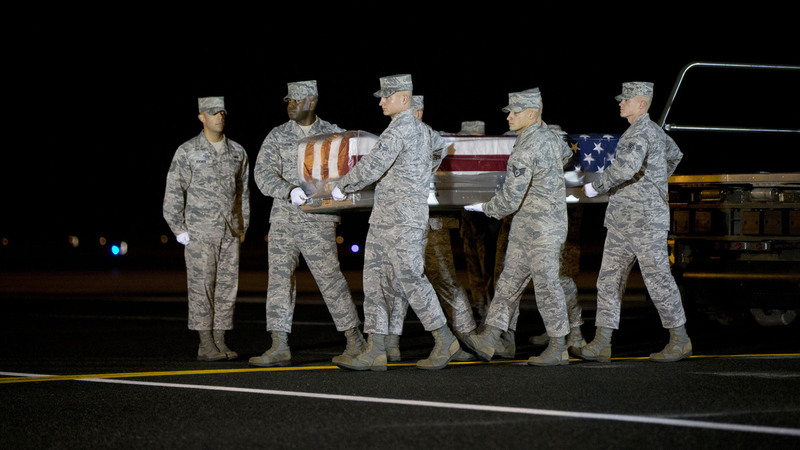 An Air Force team carries the transfer case with the remains of Maj. Phyllis J. Pelky at Dover Air Force Base, Del., on Tuesday. Pelky, 45, was killed two days earlier in a helicopter crash in Afghanistan. Though the U.S. formally ended its combat role in Afghanistan last year, 25 Americans, including military personnel and civilians, have been killed there this year. Iraq: Obama's decision to keep troops in Afghanistan comes in the wake of the bitter experience in Iraq, where all U.S. combat forces were withdrawn at the end of 2011. It was relatively calm at the time, and Iraq's leaders opposed a continued U.S. military presence after almost nine years of a U.S. occupation that peaked at well over 100,000 troops. But as the Islamic State roared into western and northern Iraq in the summer of 2014, Obama felt compelled to launch a limited air campaign against the extremist group. The U.S. now has more than 3,000 military personnel in Iraq. The Americans are focused on the airstrikes and are not permitted to take part in ground combat. But progress has been slow and Obama has said repeatedly that the effort could take years to achieve its aims of degrading and ultimately defeating the Islamic State. Syria: The scale of the U.S. air campaign in Syria is similar to the one in Iraq, but the Syrian war poses even greater challenges. While the American military is working with the governments in Iraq and Afghanistan, the U.S. is still searching for a strong partner in Syria among the many factions fighting President Bashar Assad's government. The Kurds are pro-American and have fought effectively in the northeast of the country, but are unlikely to go beyond the limited areas where the Kurdish population is concentrated. Other moderate rebel groups have generally been losing ground to the Islamic State and other extremist groups. A U.S. attempt to build a Syrian rebel force never got off the ground. Russia's entrance into the fighting in support of Assad has further complicated the equation. Obama says Russia is making a major mistake, but he has not announced a change in U.S. policy. As Obama nears his final year in office, the U.S. role in the region's wars has been scaled back dramatically. But he's still wrestling with the same sticky problems he inherited: wars that are intractable, an American public weary and wary of more combat, and security threats that stubbornly refuse to go away.